Status: Abundant regular spring and fall migrant statewide. Uncommon, locally common, regular breeder statewide. Rare casual winter visitor. Documentation: Specimen: UNSM ZM12441, 14 Apr 1909 Cass Co.
Taxonomy: No subspecies are recognized. This species was recently moved to genus Spatula from Anas, based on genetic studies (Chesser et al 2017). Hybrids with Cinnamon Teal are regularly reported; most readily identifiable are males that resemble Cinnamon Teal but with the white facial crescent of Blue-winged Teal. There are earlier reports of one photographed 18 Feb 2017 Lincoln, Lancaster Co and 24 Feb 2006 Lancaster Co. Typically, arrival is in mid- to late Mar, with peak numbers occurring around mid-Apr, but large concentrations continue into early May. High counts: 2500 at Harvard WPA, Clay Co 30 Apr 2005, and 1825 at Crescent Lake NWR, Garden Co 23 Apr 1996. Summer: Nesting has been documented for nearly all regions of the state. Summer concentrations are highest in the Sandhills; elsewhere pairs are scattered throughout the state in appropriate breeding habitat. This is the most common nesting duck species in the Rainwater Basin of Nebraska, comprising 50.4% (n = 206) of all duck nests reported 1958-62 by Evans and Wolfe (1967), 67% (n = 190) of all duck nests reported 1984-85 by Schroeder (1986), and 74.1% (n = 723) of all duck nests reported 1981-1986 by Harding (1986). Dependent fledglings: 26 May- 3 Sep.
Detectable fall movement is evident by mid-Aug, with numbers peaking early to mid-Sep. 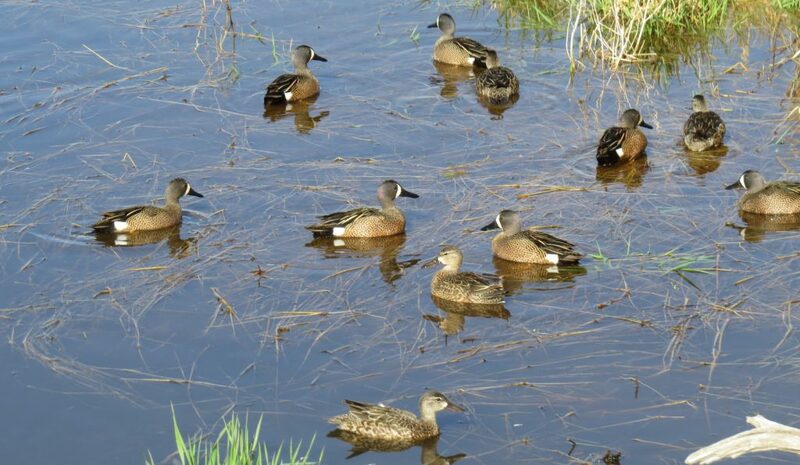 Most Blue-winged Teal concentrate in fall on the northern Great Plains prior to moving to the Atlantic Coast and then to wintering grounds in Central America and northern South America (Baldassarre 2014). Small groups may remain in the state until late Oct. There are 11 later dates in Nov and Dec, latest the 12 on the North Platte CBC 15 Dec 2012, a pair in Lincoln, Lancaster Co 18 Dec 2000, one on the Omaha CBC 18 Dec 2010, one on the Ames CBC 18 Dec 2012, and one in Scotts Bluff Co within three days of 20 Dec. There are three reports for Jan (see Winter). High counts: 14,500 in the eastern Rainwater Basin 2-3 Sep 2000, 6000 at Funk WPA, Phelps Co 19 Sep 1999, and 4200 in the eastern Rainwater Basin 22 Aug 1999. Winter: The only documented records of presumed over-wintering birds are of an immature male seen at Lake Ogallala 16 Dec 1999 and 29 Jan 2000 (Brown and Brown 2001), an adult in an open spring-fed pond in Lincoln Co 12 Jan 1991, and one in Madison Co 13-15 Jan 2016. Blue-winged Teal, Sioux Co., 25 Apr 2014. Photo by Joel G. Jorgensen. Photograph (top) of a Blue-winged Teal at Fontenelle Forest, Sarpy Co, 17 Apr 2015 by Phil Swanson. Evans, R.D., and C.W. Wolfe. 1967. Waterfowl production in the Rainwater Basin area of Nebraska. Journal of Wildlife Management 33:788-794. Schroeder, L. 1986. Duck nesting studies, South Dakota and Nebraska 1984–1985. Unpublished interoffice memorandum, April 15, In Rainwater Basin of Nebraska migratory bird habitat Acquisition plans. Prepared jointly by the U.S. Fish and Wildlife Service (Grand Island, Nebraska, USA) and Nebraska Game and Parks Commission (Lincoln, Nebraska, USA).